A group of Brown computer science undergraduates has created two new digital museum experiences included in a traveling exhibition dedicated to the history of the illustrious Nobel Prize. The exhibition runs in Singapore for the next three months. PROVIDENCE, R.I. [Brown University] — This past weekend in Singapore, the Nobel Prize Foundation unveiled a new traveling exhibition dedicated to the world’s most illustrious set of prizes. Among the objects and memorabilia on display are two panoramic 82-inch Microsoft touch screens, offering guests an interactive tour through the history of the Nobel Prizes, as well as the laureates to whom they have been awarded over the years. Those interactive digital experiences happen to be the handiwork of a group of Brown University undergraduates, who crafted the exhibits under the direction of computer graphics pioneer Andy van Dam, the Thomas J. Watson Jr. Professor of Technology and Education at Brown. The project started last summer, when the Nobel Foundation reached out to Microsoft in search of a new software platform for their digital exhibits. Microsoft turned to two research groups that had appropriate software to submit proposals. One of those groups was Brown’s Touch Art Gallery (TAG) group, which van Dam has overseen for the last four years. TAG software is designed to enable museums and educators to digitize and contextualize artwork and manuscripts, especially those too large or fragile to be viewed in person. The first of the two experiences that the students developed centers around Alfred Nobel’s last will and testament, the very document that established the annual prizes in chemistry, physics, medicine, economics, literature, and peace. Nobel’s handwritten will serves as the anchor for the exhibit, with key words and phrases linking to interactive photo collections that tell the story of Nobel’s life as an inventor and industrialist. The exhibit includes galleries with images of Nobel medals and the handcrafted diplomas each laureate receives. Users can also take any of six virtual tours highlighting key places and people in Nobel’s life. The tours include audio narration and Ken Burns documentary-style panning and zooming images. The tours can be stopped and started at any time so users can explore the photos and additional linked material in more depth, using the pinch-zoom functionality familiar to any smartphone or tablet user. Visitors to the Nobel exhibition can start and stop this interactive tour and explore parts of it in greater detail. The second experience includes information on all 900 past Nobel laureates. Users can sift and search through the winners by prize category, year, country of origin, gender, and other attributes. Photos of the laureates link to brief biographies and information about the work that earned them the prize. In addition to the 82-inch display, the experiences also run on a separate 55-inch display, as well as several Microsoft Surface tablets arranged around the exhibit hall. The existing TAG software was well-suited for the task, Green said, but the group needed to make several key modifications to make the Nobel experiences work. For example, TAG is designed to be connected to the Internet, but there was no reliable connection available at the exhibit’s first showing at the ArtScience Museum in Singapore. So the group had to load all the data directly onto the machines — a fairly labor-intensive task, Green said. Designing for a colossal 82-inch display was another challenge. “It’s absolutely huge in person and it was something we’d never tried before,” Green said. “When you’re standing there touching it, you can’t see the edges of the screen.” That meant the team had to take special care to make icons, menus and other objects discoverable on the sides of the screen. 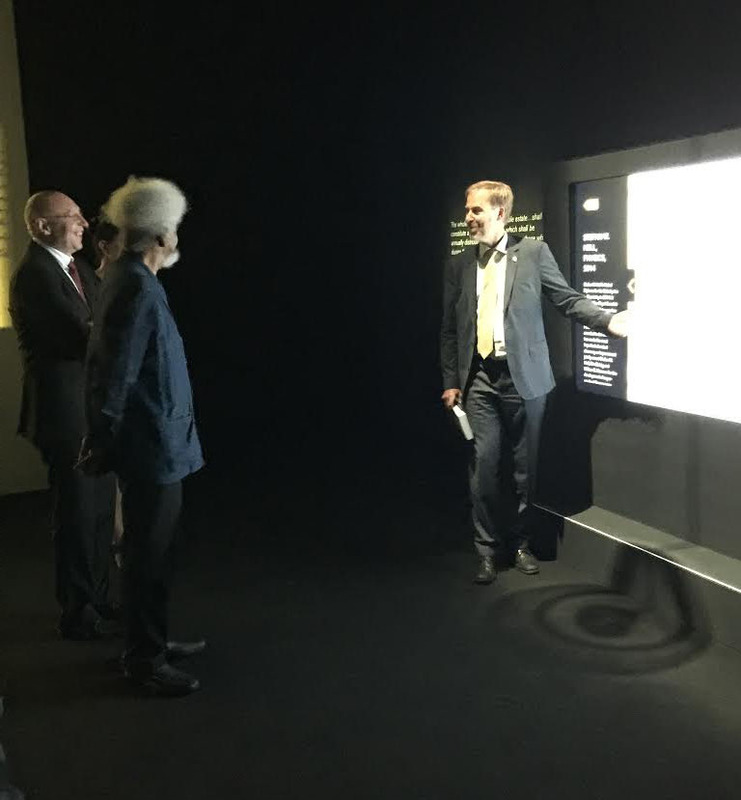 Nobel laureates Wole Soyinka and Stefan Hell take a look at the digital presentation of Alfred Nobel’s handwritten will. The team spent many hundreds of person-hours getting everything exactly as they and the Nobel Foundation wanted it. All that work paid off when Green traveled to Singapore last week to install the exhibit. “The install went amazingly smoothly,” he said. But the real payoff was watching rapt audiences use the displays. In particular, Green got to see two Nobel laureates — Wole Soyinka, winner of the literature prize in 1986, and Stefan Hell, who won the chemistry prize last year — interact with the displays. “That was really cool,” he said. The TAG group grew out of an ambitious project begun by van Dam and his group nearly a decade ago to digitize a work of art called the Garibaldi Panorama. The Garibaldi, a two-sided watercolor scroll, stands four-and-a-half feet tall and stretches a staggering 273 feet long. Too large and fragile to be easily viewed or studied by scholars, the digital version enables people to interact with and view the work in a way that wasn’t possible before. The Nobel exhibit is the latest feather in TAG’s cap, and van Dam says he’s proud of the work his students did. The exhibit will run at the ArtScience Museum in Singapore for the next three months and then begin touring the globe. Future venues will be determined in the coming months.